An anonymous 'tip' hit my email box, saying that the World Sports Park, aka cricket park, aka Gaelic sports park, was in fact presented to the Parks committee on August 23 last year. The sender shared a link to the minutes of that meeting, directing me to page 23 of that pdf. The email also sent me to one of the Mayor's Initiatives pages on the Indy.Gov site, dedicated to this park on the site of the current Post Road Community Park. The plan shown there is different, even in shape, much less field types, from Williams' slide. 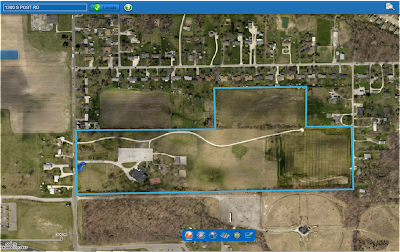 The Indy Parks website shows a map of the Post Road Park, which is the same rectangular shape was included in the budget presentation. I was unable to find any World Sports Park in the list on the Indy Parks website. Back to the Mayor's initiatives page - there is contained on that page a link to a World Sports Park 'brochure', which turns out to be a bigger version of the map shown on the main page. Right clicking I was able to get the creation date of that document - 4/16/2013 3:08:33 PM. My, but, that is the same date as the Mayor's Indian announcement of the project. What a coincidence. Mayor Greg Ballard revealed Tuesday during a trade mission to India that Indianapolis hopes to host the inaugural United States Cricketing Championship next summer or fall. It was the first public announcement of the city's plans, and suddenly shed light on a $6 million project to create a complex that would host the event on the city's far east side. Already, Ballard has enlisted the Indiana Sports Corp. and Visit Indy, the city’s tourism arm, to help attract, promote and conduct the cricket event, according to Marc Lotter, a spokesman for the mayor. The event will be sanctioned by the United States of America Cricket Association. Lotter told IBJ the effort to host the event is part of the initiative to transform a 40-acre city park in the 1300 block of South Post Road into an international sports complex capable of hosting local, regional, national and international cricket, rugby, lacrosse and hurling events. One multi-use field already is complete at the Post Road Community Park and is being used by the city’s local cricket club, Lotter said. The park will be renamed Indianapolis World Sports Park. The $6 million project began two years ago. Lotter said that once it is complete in summer or fall of 2014, the park will have five athletic fields and be capable of holding events attracting as many as 10,000 spectators. 10,000 spectators. Here is the aerial of the park property at 1300 S. Post Road, captured as a screen shot from MapIndy. This aerial was taken in the spring of 2012, and you'll note the cricket playing field was not yet installed. I wonder what the neighborhood thinks about this? Evidently, at least one neighbor heard the same day the rest of us did, as they texted Councillor Brown during the April 18 Public Works committee meeting while this project was being discussed. DPW personnel, including Director Lori Miser, could not say how much outreach the Parks Department had done in the area. Well, I've rambled on. This project may have been know by certain insiders, but it was kept very low on the radar. Way too low for some Councillors, and way too low for the public who will foot the bill for at least $5.8 million. As I noted in my last blog entry, SB621, which has now passed through the Legislature and awaits Governor Pence's signature, would remove the ability of the County Commissioners to make two appointments and give one to each of the Mayor and the Council. The law takes effect on July 1, 2013, presuming, as I do, that the Governor will sign it. However, by state law, the appointing body gets to set the term of its appointments. The President of the County Commissioners, and County Assessor, Joe O'Connor, informs me that when Cornelius Brown was appointed in September, 2012, it was for a one year term through September of 2013. When Ed Mahern was appointed in January, 2012, it was for a 3 year term, which would expire at the end of December, 2014. (1) Five (5) members, of whom no more than three (3) may be of the same political party, appointed by the executive of the consolidated city. (2) Four (4) members, of whom no more than two (2) may be of the same political party, appointed by the legislative body of the consolidated city. The new state law does not specifically terminate existing appointment terms. Nor does it say which new appointing body would get to exercise its new appointment power. SB 621, which tries to extend the life of Republican rule over Marion County, has passed out of the Conference Committee changed from the form it had when entering that body. The body itself was changed, substituting Republican Senator Waltz for Democrat Senator Breaux, and Republican Representative Speedy for Democrat Representative Bartlett. Having shed any semblance of bipartisanship, the all Republican group passed their version of a 'compromise' piece of legislation. All sections of the bill now clearly apply only to Marion County. As we all expected, the 4 At-Large Council seats are again to be eliminated. The Controller can now 'only' change the budgets of all Departments and Offices if the revenues drop from the levels expected when the budget was passed and 'only' twice a year. The County Commissioners still lose their two appointees to the Metropolitan Development Commission, but one is shifted to the Mayor and one to the Council, giving the Mayor 5 and the Council 4 appointments. Lake and Allen Counties are struck from the burden of having to count all absentee ballots at a central location - now only Marion County must do so. And, Marion County's Township Boards drop from 7 members to 5 at the next election. (3) for a term of one (1), two (2), or three (3) years, as designated by the appointing authority (in the case of the metropolitan development commission). A member serves until his successor is appointed and qualified. A member is eligible for reappointment. So, one outstanding question is, when the Marion County Commissioners appointed Cornelius Brown and Ed Mahern, for what term did they appoint them? The new section regarding the appointing bodies takes effect on July 1, 2013. But at what time would the Mayor and the Council get to begin taking over those two appointments? The shift of MDC appointments has always been the worst of the Republican power grab, and will leave Indianapolis and it Citizens even more at the mercy of Mayor Vaughn and his rapacious appetite for giving away taxpayer money to favored developers, regardless of how many employee contracts he has to gut or how many cops and firefighters he has to lay off to afford doing so. The July 11, 2012, meeting of the Board of Public Works appears to be the first time a contract was let regarding the 'Gaelic Sports' park known as the World Sports Park. Larry Jones presents a contract to scope out the feasibility of creating a second cricket field at a park on South Post Road, north of Brookville Road, that would meet international standards. He notes that the contract would be with Crawford, Murphy, and Tilly, Inc. because it was chosen by Indy Parks for the work back in 2010. ReBuildIndy money would be used for this initial work, but Jones does say that if it is determined feasible, then the cost would be 'substantially higher' - but no cost estimate is asked for or divulged. The motion almost fails for lack of a second. Still scanning through the Public Works Board meetings for discussions of the 'Gaelic Sports' complex to be known as World Sports Park. A Board member had to ask where this park is located. Here is the short segment of the meeting that dealt with the WSP. I began looking for the Public Works Board meeting that actually approved the $5.8 million cricket fields dubbed 'City of Indianapolis World Sports Park'. I caught an allusion to 'last fall' in today's Board of Public Works meeting, so began cruising WCTY's archives starting with September, 2012. I found an item on the December 5, 2012, meeting of that Board - a 2nd amendment to a contract regarding the project. The ensuing discussion among Board members brings out the expectation that this project will total $10-15 million, be part of a public-private partnership already being worked on, and is being done in conjunction with the Parks Department, which failed to mention anything to the Council. I've embedded the entire conversation and will bring forward any other clips of other meetings where the 'gaelic sports' are mentioned. This is what you get when parties are more important than honest government set up for the benefit of the people. In this case, it is the Republican version of how that party would like to operate government - by itself. The Indiana Legislature is overwhelmingly Republican at this point. During much of recent history they have been mostly Republican in the Senate and see sawing with Democrats for the majority in the House. What happens when you want Republican control ensconced in Uni-Gov? You create 4 At-Large positions to ensure that Republicans will enjoy the majority in the Council. The County wide elections for all other offices ensure Rs will control all divisions of Indianapolis for generations. What happens when a Republican Mayor of Indianapolis simply doesn't pay into the police and fire pensions that are still the City's obligation? Nothing. Then what happens when a Democrat Mayor of Indianapolis faces having to pay the promised retirement money due to actual retirees, and the money is not there in the pension fund? Nothing. At first. Then, the Legislature tells him he can raise taxes. When raising taxes sinks that Democrat Mayor and he is followed by the accidental and now ceremonial Republican Mayor who bumbles in his testimony before the Legislature, what happens? The Legislature take the pension obligation off his hands and let him keep the tax increase anyway. What happens when a lawyer turned Councillor turned lobbyist finally morphs into Chief of staff/non-ceremonial Mayor? That's when all the mean spirited, mud wallowing, take no prisoners stuff hits the fan. That's when the budgets of duly elected Democrat officeholders are slashed in a blackmail bid. That's when passing two tax increases must include 8 Democrat Councillors, and not just enough to gain a majority on top of all Republicans voting in favor. That's when 'cooperation' turns into capitulation. The Democrats on the Council (with a couple of exceptions) have done little except capitulate. They and their Republican brethren have not been very interested in securing and protecting the role of the Council as a body independent of the Mayor's office. So, now we see the logical extension of a power grab that has been operating for some time. Get rid of the 4 Council At-Large positions, now likely to remain Democrat, and hope you can still manage to get a slight majority of Republicans to again win the 25 District seats come 2015. Get rid of the County Commissioners', now likely to remain Democrat, appointments to the MDC and hand them to the Mayor. 'Allow' the Council to consolidate the Sheriff's Department, now likely to remain in Democrat hands, with IMPD and put it under the Mayor. If revenues dip, allow the Controller, under the Mayor, to cut any budget he likes in order to match revenues with expenses - without going back through the Council, which heretofore was the fiscal body of the City. The bill, SB 621, passed both chambers and now is in Conference Committee to work out differences in the versions passed. IndyStar Legislative beat reporter, Mary Beth Schneider, tells us how things went in that Committee. When the bill was heard earlier in the session, lawmakers heard from dozens of people opposing the bill, including one GOP councilwoman, Christine Scales. Only two people spoke in favor of it: Joe Loftus, the lobbyist for Indianapolis Mayor Greg Ballard, and Rep. Mike Speedy, an Indianapolis Republican who formerly served on the City-County Council. Republicans used a joint House-Senate conference committee to try to erase any impression that there is little support for the plan. In a hearing that lasted six hours, other Republican members of the council, including Janice McHenry and Will Gooden, indicated at-large council members are anonymous at best and meddlesome at worst. They brought in the star-studded duo of Republican Councillors Holden and McHenry (Gooden appointed to replace Ryan Vaughn on the Council a year ago, and McHenry who always sides with the Republican party) to testify against the At-Large positions. Councillor Shreve would be the only Republican Councillor they could choose who might have less gravitas than these two. No doubt Gooden and McHenry's oratory and logic were stunning, because the At-Larges are back on the chopping block. Personally, I suspect it has less to do with purported anonymity and meddlesomeness, than simply because those offices are held by Democrats and that is inconvenient to the Republican Party. The two Democrats on the Conference Committee say they will not vote in favor of this version of SB 621. Interestingly, in a game of chess way, Conference Committees have no majority party. Two Senators, one of each party, and two Representatives, one of each party, compose these committees. Obstinate appointees can be replaced. In this case, obstinate Ds can be replaced by cooperative Rs, who are in abundance in both chambers. No telling if swaps will be made. And, there is no telling if the revised version that comes out of the Conference Committee will pass both chambers in that new form. This Legislative session is drawing to a close; with April 29 being the last day it can adjourn. So the current heavy handed Republican reach into Indy's governance will soon end. But, do not expect this to be the last chapter; it wasn't the first, second, third or fourth chapter. The Ethics Committee of the City- County Council did indeed meeting this past Thursday to consider Councillor Mahern's Prop 28, which would require full disclosure by Council members when they or their family members received gifts, including tickets to sporting events provided by the CIB. The meeting took less than 5 minutes to complete. Councillor Mahern requested that this proposal be struck, with the intention that he would introduce a similar proposal that would include other elected City officials, including the Mayor. The Committee tabled Prop 28 indefinitely, which has a similar effect as striking the proposal - it is dead. Here is the clip of Mahern's testimony before the committee (in attendance were Councillors Robinson, Hickman, Simpson, Evans, and Shreve - so this committee continues to be in flux). Two Council committees will meet tonight, both beginning at 5:30 pm. Public Works will get the big room and the live WCTY feed. So, we'll have to wait for tomorrow's posting online and subsequent airings to see what the "Ethics" Committee does with Prop 28, which "amends the Code concerning ethics disclosure to ensure more transparency with respect to gifts provided to Councillors and their families". This proposal was heard by the committee on Valentine's Day and can be viewed in the WCTY archives. Only 4 of the 6 members showed up to discuss more disclosure to the public. This is the minimum needed for a quorum. There was much wringing of hands and gnashing of teeth, but no vote on the proposal. The list online shows the committee to be chaired by Councillor Robinson, with other members being Simpson, Miller, Shreve (took over for Freeman who is still listed) - the 4 present. Missing were Brown and Cain. Councillor Simpson ended the meeting saying to the proposal's author, Councillor Mahern, "Let's really work on this", and "Good work, Brian". The proposal was continued to the next meeting of the committee, which was to be March 14. The is notice of a March 14, 2013, meeting of this committee, but no minutes or WCTY video are posted. Prop 28 was the sole item on that agenda, as well. An email exchange with SaRita Puckett, Ethics committee secretary, clarified that there was, in fact, no meeting held that date. This proposal is pretty darned simple - on top of existing reporting requirements for gifts, it would also require that Councillors disclose receipt of gifts from Municipal Corporations (like the CIB). It would require that dollar amounts be estimated for the value of gifts received. And, it would require that gifts made to Councillors' spouses and dependant children be disclosed. Not all gifts require disclosure in the current or proposed Code on ethics - only those valued at more than $100 for one gift, or an aggregate value of more than $250 in a calendar year. So, a cup of coffee shouldn't tip anyone's scale. But tickets to sporting events would definitely tip the scales. Tonight we shall see if this Council would rather be open and above board in disclosing what tickets to what sporting events they and their family are treated to, or if they'd rather keep the public in the dark and guessing. This committee will not bring forward a proposal that would embarrass the full Council by forcing a vote to strengthen the public's right to know, when that vote would be a very public and very accountable 'no'. We shall see if Councillor Simpson and the rest of the "Ethics" committee really want to make this proposal the best it can be - or if they want to bury it. After less than one year on the job, MSD Decatur Township Superintendent is leaving that post. In an email to employees, Sullivan sited personal reasons for stepping down. In addition, she appears to say she will remain on staff, but no mention of the exact position is given. Sullivan was selected without a search by the outgoing School Board last Spring. Many in the community want a real search with public interviews and input this time around. I am writing this evening to share with you my discussion with our School Board members earlier tonight. After a great deal of thought and for personal reasons, I have made the decision to retire at the end of this school year. I am very proud of the accomplishments made during our Learner-Centered journey, and attribute our success to the efforts of all our dedicated staff members and student families. I am grateful to have been given the opportunity to spend my career of 28 years in Decatur Township. I know that with our excellent staff and supportive families, Decatur’s Journey will continue to provide bright futures for our student learners. With the leaders and learners we have at Decatur, I leave with the knowledge that Decatur will achieve new heights not yet dreamed of. No one could ask for a greater honor than I have received by working with professionals who give their minds, hearts, and careers to our children. Please know that I will continue working alongside you with the same focus and diligence, and ask for your support as our School Board determines the leadership for the next great step in our journey. Our Board is very focused on next steps and it is their hope to make an announcement prior to the end of the school year. Will the CIB's New Found Wealth Get SB 90 a Hearing? It's easier to follow the plot of Games of Thrones than it is to track the fortunes of the CIB. Is today a day when the CIB is rich? Or, have they fallen once more on the verge of bankruptcy? Whenever budget time comes around, when a PILOT is discussed, or when the Mayor's office gets an itching for an even bigger CIB slush fund - well, then the CIB is pennies away from bankruptcy court. At those times, its a wonder Peter Francis Geraci hasn't been placed on their Board. And, after pleading poverty in order to get their hands on two new tax increases, the CIB just yesterday managed to find $2 million for Lucas Oil Stadium improvements. Maybe they found the money in the seat cushions. At budget time they weren't sure they had enough money to get matching carpet for the older sections of the convention center. This $2 million follows the additional $10 million ($5 million from 2012 funds and $5 million from 2013 funds) recently handed over to the Simons. It seems the CIB was $12 million better off than they led us to believe. Some might think they knew about these 'expenses' when they were protesting the $15 million PILOT levied against them by the Council Democrats. That, of course, was before eight of the Council Democrats caved in and swapped the PILOT for two tax increases. But, I digress. Let's not forget who is running the show. The Mayor gets 6 of the 9 appointments to the CIB. The same Mayor who wants to neuter the Council (and gets most of the Republican Councillors' blessing to do so). The same Mayor who puts out to the press the possibility that THIS next budget may have to include police and fire layoffs to make ends meet. This same Mayor who is spending tens, if not hundreds of millions from TIF slush funds, Airport slush funds, and CIB slush funds to make certain people wealthy and help others climb higher on the Forbes richest people in the world list. This Mayor's priorities are screwed up and he needs to be held accountable. All the CIB stuff hitting the fan yesterday, made me wonder what happened to Senator Mike Young's bill to cut off the two recent CIB tax hikes after 10 years. That's SB 90 and it seems to have cleared the Senate on a party line vote - Democrat Mark Stoops joined all Republicans in voting for the bill. That was February 12. On February 26 it was assigned to the House Ways & Means committee, where it appears lifeless. Maybe the House will now find ample reason take action on this bill. Its the least they can do to protect the public from paying taxes for frivolous items that will never benefit the community. For those interested in the growing power of the Mayor's office, you might want to keep an eye on the alarming autonomy being handed to the Airport Authority. A recent ruling by the Indiana Court of Appeals held that Airport Authorities do not have autonomy over the zoning on their property, but rather must go through the local municipality's zoning process. That was last fall. The Indianapolis Airport didn't care what the law was. They did not file a land use petition with the City of Indianapolis for the new solar park on which City officials gathered to break ground last month. No, they just did what they always do - what they damn well please. HB 1045, introduced to pull military airports located in Indiana, into the State's airport systems plan if an airport is also used for civilian air traffic, has been totally transformed to give the Airport Authority unfettered access to do whatever they want. As it now stands, HB 1045 has passed the House, the Senate, and is returned to the House to okay amendments. It no longer contains the joint military/civilian airports at all. Now it allows Airports to legally do what they already have been doing - using their land for any purpose they want without public review and without regard to local zoning laws. Additionally, they will be able to enter into leases greater than 15 years for more than just the land, extending to 40 years the lease of buildings as well. They can also use building funds to assist in interstate transportation, not just for intrastate benefits. For anyone who has to live near the airport, the fact that this bill will let the Indianapolis Airport to run rough shot over uses on private land is disturbing. Look at the airport perimeter - one billboard after another, showing how little regard the Airport gives to local laws and the public aesthetic behind those laws. All those private businesses who have to compete on an unfair playing field because of the Airport's tax free status will continue to suffer. Add on top of that the Airport's complete disregard of the effect of allowing incompatible uses on land it owns abutting private property, as long as they can make a buck in the process, and you have a recipe for degradation of land values next to the Airport. I have been waiting for the City to follow the law and insist that the Airport run its zoning through the local public process - as determined by the Courts. But, I guess they were all in on this hijacking of the Legislative Session to pull this fast one on an unsuspecting public. One consistent hallmark of all of City budgets since Ballard was elected Mayor, has been the early public relations effort flowing through the press, trying to shape what the public thinks about the budget. For instance, in the first couple, while revenues were growing, the early press claimed near-crippling shortfalls. The early press dictated the later press. As the recession's impact actually began, and election rhetoric was heating up, the early press claimed near dodges of cuts in services - while the administration pulled tens of millions of dollars from the downtown TIF to make ends meet, hoping not to be noticed. We now enter the post-recession era, as property values are rebounding. Now what will they blame for any budget difficulties? Income tax revenues are expected to grow. Increased property values should lead to fewer people hitting the tax caps. Budgets, by all revenue accounts, should be getting easier to manage than the past few years. In Marion County, the treasurer’s office estimates that 64 percent of the 366,264 bills it will send out for properties of all types will reflect an increase. The total amount being billed this year, slightly more than $1 billion, is up 4 percent. There are three sources for the increased bills and the increased total tax collection. First is the increased assessed value for Marion County property. Property values outside of TIF districts increased by 1%, according to the budget order of the Department of Local Government Finance. Second is the increased property tax revenue being requested by the various governmental units. The third is all property value kept from paying for local government services because they are either consumed by TIF districts or deliberately kept as government-owned, tax-free, property. Today, Murray's story is about the behind the scenes discussions on the 2014 budget, which are said to be veering necessarily to layoffs of police and fire personnel, among other cuts; "Indianapolis, Marion County leaders are finding $30M in budget cuts a tough task". Now administration and council leaders are staring at options that range from eliminating vacant positions, renegotiating contracts and making simple accounting transfers to much more difficult considerations, such as cutting back on a parks after-school program or transferring some pools on school grounds back to Indianapolis Public Schools’ control. Then there are the possibilities of police furloughs and layoffs of firefighters and deputy prosecutors, as well as cutbacks on public defender services. They want you to blame property tax caps for any coming public safety service cuts. A new wrench in the debate is recent notification from the state that tax caps were expected to trim $10 million more than expected from the municipal budgets this year, adding more pressure to cut back. So, how did property tax cap penalties grow so much? If the assessed value is rising on 64% of all property owners, fewer people should be hitting the tax caps, and the tax cap penalty hitting local government should be dropping. The silent player in all of this are the TIF districts - which were expanded significantly this year despite the fact that they accounted for over 40% of the tax cap penalties for local government last year. The more property value consumed by TIF districts, the higher the hit on local government's coffers. Its simple. Any real long term solution will have to put more property value on the non-TIF property tax rolls. We MUST retire older TIF districts as their oldest bonds become due. We MUST call on the Airport to return to the tax rolls, the hundreds of acres it does not need for aviation purposes. We CANNOT grow fast enough through so-called economic development cash giveaways to compensate for the speed with which we have grown our TIF districts. Yes, this year they'll blame tax caps, when they have shown no desire to limit the real cause of the post-recession budget difficulties. I've been away from this blog, intent on a hearing Tuesday afternoon before the Board of Zoning Appeals. As Chair of the Land Use Committee of the Decatur Township Civic Council, I was focused on opposing a variance for a 130 acre parcel which would allow the construction of a solar farm, by Sunrise Energy Ventures (SEV). We lost that endeavour by one vote. My heart breaks for the new burden this imposes on my community; adding to the other burdens cast our way for the 'common good'. In this blog entry I'll try to be succinct in our core issues with the use of this parcel for a solar power plant. Then I'll move into the the broader implications of the lack of preparedness for solar in Indy's government, the carpet-baggers swooping into Decatur and Franklin Townships, and the very real chance that newly approved solar power plants will add to the tax base or the job market in any sustainable way. The parcel in Decatur is right across the street from the Crossfield subdivision. To the south there is mostly farm fields, with metes & bounds homes lining the few streets - Mann Road to the east, Ralston Road to the south, and Southport Road on the north. The only sewer and water lines that can provide infrastructure for the future development of this area must come from extensions of those lines in Crossfield. Without the solar power plant, this infrastructure, along with street flow, would go through this parcel, minimizing the expense of providing further extension to area. With the solar power plant, the infrastructure will be more expensive, having to be placed around, not through, the parcel. In fact, the farm that shares the eastern boarder of this parcel, is entirely land locked. The grant of variance makes it highly unlikely this parcel will be developed, even after the market rebounds, given the expense. The southeastern corner of our Township is valuable to our future because it has always been seen as the area most conducive to move-up housing. While some areas of Indy bemoan lack of million dollar mansions with which to entice business executives, our vision is far more pedestrian; reaching for high end homes running maybe $150,000 - $200,000. The southeast corner is home to Southwestway Park, the second largest regional park in Indianapolis, and the only Indy Park with horse trails. Winding River Golf Course, a public golf course, also calls this corner home. This area is also the only one with rolling terrain. Decatur loses residents due to our lack of move-up housing. Decatur has obstacles with enticing basic commercial to locate, due to lack of residents and the presence of the Airport and its ban of residential uses nearby its borders. Its all chickens and eggs. But, three successive Comprehensive Plans, reaching back to when we were conscripted into Unigov, have called for low density housing in the southeast corner of Decatur Township. As our district Councillor, Jason Holliday, put it, "Any way you cut it, we are the experiment". That is because there has been no task force put together by Indianapolis to set appropriate locations, appropriate development standards, and appropriate decommissioning guarantees for the benefit of Indianapolis taxpayers and residents. I the last ten days I have learned a lot; a lot that has distressed me beyond the implications for Decatur. It turns out that SEV, along with other solar energy concerns, spoke with City officials about construction of solar power plants beginning about three years ago. But, the City did not invest in creating a task force to add to our zoning ordinances so that accessory and primary solar power uses could be tailored to Indy's needs and desires for solar. To this day they have not. A similar situation arose regarding cell tower construction near the end of the Century, and a task force of neighborhood people, industry representatives, planners and lawmakers was convened. The result was the Wireless Communication Zoning Ordinance, adopted in 1999. During the last few years, cities, counties and states all across the Country have been reviewing, debating, and crafting their own solar ordinances and laws. But, not here. Frankly, this left us sitting ducks. The method of financing the eventual decommissioning of the solar power plant would have been addressed with such a task force. As of Tuesday, the City and the petitioner had not yet agreed on a way to guarantee that the plant would be decommissioned. The City originally requested a bond, but the petitioner counter offered that the City could take possession of the property, if the then-owner failed to remove all panels, posts, and DC to AC inverters when the plant was no longer selling electricity to IPL. (SEV and IPL have an agreement for 15 years of sales.) I do not know where the current discussions are, nor what they are entertaining. All I know is they had no agreement by the time of the BZA hearing. Code officials and inspectors need to understand what they are looking at in order to efficiently and completely evaluate solar installations. A solar knowledgeable inspector will be better equipped to identify system flaws which may endanger others, while not introducing unnecessary delays into the permitting process because they are not sure how to evaluate a system. Solar trained code officials are in every one’s best interest, from the customer to the installer to the public as a whole. The SAC group says specific training is a must. Do we have that expertise? I do not know. The program was successful in attracting interest. It attracted far more interest than the 100 MW limit of the pilot program would allow. And, it attracted out of state players, who were attracted by the profit and who would not leave much permanent employment behind. IPL went back to the IURC, asking that the Rate REP pilot program be limited to IPL customers. IPL representative, John Haselden's comments are noted in the March 7, 2012, Order of the Commission (IURC). Mr. Haselden explained that by February 1, 2011, IPL had received applications for interconnection for twenty-five stand-alone renewable energy projects which would produce annual output of approximately 240,000 MWh if all proposed capacity were constructed, or 160% of the cap on Rate REP energy purchases. He said, that assuming all or most of the proposed capacity from stand-alone renewable energy projects were constructed, no additional capacity would be available for IPL's customers. As a result, projects proposed by IPL's customers, like those being discussed by the Indianapolis Airport Authority, would not be eligible for the purchases under Rate REP because capacity would not be available. He said that allowing non-customer developers of stand-alone projects to reap windfall profits at the expense of all IPL customers over the next decade is not in the interest of IPL's customers. Mr. Haselden testified Rate REP offers several benefits to customers who elect to participate, including a payment stream. This helps to keep money flowing into operations located in Indianapolis that produce jobs long after construction of the facilities is complete. The IURC chose to split the baby, agreeing to limit the majority of the 100 MW cap to IPL customers, but putting 30 MW into a reverse auction whereby a company would propose how much electricity would be generated and what price IPL would pay. The auction attracted 21 companies, offering 70 bids. SEV lowballed everyone, winning all 30 MW offered, at a price of 10 cents/kW hour. 8.6 MW would be generated from the Decatur site, and 20 MW from the Franklin Township site. the owners of the solar power plant could still appeal that assessment. So, it is quite possible that little to no extra tax revenue will actually be generated by these solar power plants. Additionally, these two sites are expected to create 120 temporary construction jobs for 4 months and all of 3 full time, permanent, jobs. Oh ! hallelujah ! the economic development potential of these deals is astounding ! IPL's warnings to the IURC have become Indianapolis' nightmare. An out of state company will reap the value of the next 15 year's worth of IPL customer rate increases, which could total $105.84 from the average IPL residential customer ($1.96 per month adjusted for 15 years and adjusted for these two sites generating 30 MW of the 100 MW cap of the pilot Rate REP program). The solar power plants may end up paying no extra property taxes to benefit the community. And, they will create all of 3 jobs in the process. The BZA decision will be hard on Decatur's future growth and will limit the range of commercial and residential stock that can be offered our current and future residents. The lack of a solar zoning ordinance will continue to cause seat-of-your-pants decisions by the BZAs and the MDC until one is constructed. The lack of a method for guaranteeing decommissioning of solar power plants can come back to bite the taxpayers big time. Likewise, residents living nearby one of these power plants can be bit if there are limits in the solar expertise of our code enforcement officers and permit reviewers. The rate payers, some willing and some not, foot the bill and will pay handsomely those carpet-baggers who will line their pockets, move on, and leave little but the clean-up in their wake. As Councillor Holliday put it, "Any way you cut it, we are the experiment".